The 93rd Draw for Bangladesh Bank 100 Taka Prize Bond was held and published on 31 October 2018. Prize Bond (PB) is a form of savings of Bangladesh Bank (BB) and it is interest-less bond. The lottery is commenced on every three months by Bangladesh Bank. Prize Bond (PB) is a form of savings of Bangladesh Bank (BB) and it is interest-less bond. A total of 2438 prizes announced for 53 series of the prize bonds. In each series there 46 prizes. The lottery is commenced on every three months by Bangladesh Bank. Prize Bond is a form of savings scheme offered by Bangladesh Bank, Central bank of Bangladesh, without any interest. As pre predefined rule Prize Bond Draw (Lottery ) held on every three months interval (January 31, April 30, July 31, October 31 of every year). You can download Result from the Bangladesh Bangladesh Bank website. The result link is also available at the bottom of this post. Tk 100 prize bond are divided in different series. There are a total 53 series so far and each series has 46 prizes i.e. each series has 1st, 2nd, 3rd, 4th and 5th prizes. In order that a bond is to be included in the draw, it must be purchased before at least two months of the draw date. Number of Prize Bond is every series 10 lacs. The claims for prizes can be lodged within two years after draw. As per rule 20% tax will be deducted from prize bond prize money. Total 46 prizes for each series. The 92nd Draw for Bangladesh Bank 100 Taka Prize Bond was held and published on 31 July 2018. Prize Bond (PB) is a form of savings of Bangladesh Bank (BB) and it is interest-less bond. The lottery is commenced on every three months by Bangladesh Bank. Prize Bond (PB) is a form of savings of Bangladesh Bank (BB) and it is interest-less bond. A total of 2346 prizes announced for 51 series of the prize bonds. In each series there 46 prizes. The lottery is commenced on every three months by Bangladesh Bank. Prize Bond is a form of savings scheme offered by Bangladesh Bank, Central bank of Bangladesh, without any interest. As pre predefined rule Prize Bond Draw (Lottery ) held on every three months interval (January 31, April 30, July 30, October 31 of every year). Up to January 31, 2018 a total 92 prize bond lottery was held so far. You can download Result from the Bangladesh Bangladesh Bank website. The result link is also available at the bottom of this post. Tk 100 prize bond are divided in different series. There are a total 51 series so far and each series has 46 prizes i.e. each series has 1st, 2nd, 3rd, 4th and 5th prizes. In order that a bond is to be included in the draw, it must be purchased before at least two months of the draw date. Number of Prize Bond is every series 10 lacs. The claims for prizes can be lodged within two years after draw. As per rule 20% tax will be deducted from prize bond prize money. The 91th Draw for Bangladesh Bank 100 Taka Prize Bond was held and published on 30 April 2018. Prize Bond (PB) is a form of savings of Bangladesh Bank (BB) and it is interest-less bond. The lottery is commenced on every three months by Bangladesh Bank. Prize Bond is a form of savings scheme offered by Bangladesh Bank, Central bank of Bangladesh, without any interest. As pre predefined rule Prize Bond Draw (Lottery ) held on every three months interval (January 31, April 30, July 30, October 31 of every year). Up to January 31, 2018 a total 90 prize bond lottery was held so far. You can download Result from the Bangladesh Bangladesh Bank website. The result link is also available at the bottom of this post. The 89th Draw for Bangladesh Bank 100 Taka Prize Bond was held and published on 31 October 2017. Prize Bond (PB) is a form of savings of Bangladesh Bank (BB) and it is interest-less bond. A total of 2254 prizes announced for 49 series of the prize bonds. In each series there 46 prizes. The lottery is commenced on every three months by Bangladesh Bank. Prize Bond is a form of savings scheme offered by Bangladesh Bank, Central banl of Bangladesh, without any interest. As pre predefined rule Prize Bond Draw (Lottery ) held on every three months interval (January 31, April 30, July 30, October 31 of every year). Up to October 31, 2017 a total 89 prize bond lottery was held so far. You can download Result from the Bangladesh Bangladesh Bank website. The result link is also available at the bottom of this post. Tk 100 prize bond are divided in different series. There are a total 49 series so far and each series has 46 prizes i.e. each series has 1st, 2nd, 3rd, 4th and 5th prizes. In order that a bond is to be included in the draw, it must be purchased before at least two months of the draw date. Number of Prize Bond is every series 10 lacs. The claims for prizes can be lodged within two years after draw. As per rule 20% tax will be deducted from prize bond prize money. The 88th Draw for Bangladesh Bank 100 Taka Prize Bond was held and published on 31 July 2017. Prize Bond (PB) is a form of savings of Bangladesh Bank (BB) and it is interest-less bond. A total of 2208 prizes announced for 48 series of the prize bonds. In each series there 46 prizes. The lottery is commenced on every three months by Bangladesh Bank. Prize Bond is a form of savings scheme offered by Bangladesh Bank, Central banl of Bangladesh, without any interest. 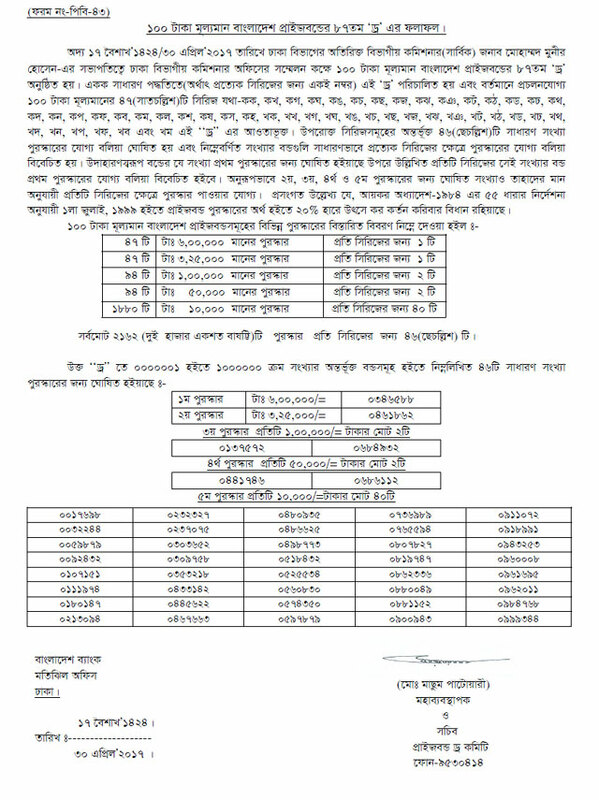 As pre predefined rule Prize Bond Draw (Lottery ) held on every three months interval (January 31, April 30, July 30, October 31 of every year). Up to July 31, 2017 a total 88 prize bond lottery was held so far. You can download Result from the Bangladesh Bangladesh Bank website. The result link is also available at the bottom of this post. Tk100 prize bond are divided in different series. There are a total 45 series so far and each series has 46 prizes i.e. each series has 1st, 2nd, 3rd, 4th and 5th prizes. In order that a bond is to be included in the draw, it must be purchased before at least two months of the draw date. Number of Prize Bond is every series 10 lacs. The claims for prizes can be lodged within two years after draw. As per rule 20% tax will be deducted from prize bond prize money. The 87th Draw for Bangladesh Bank 100 Taka Prize Bond was held and published on 30 April 2017. Prize Bond (PB) is a form of savings of Bangladesh Bank (BB) and it is interest-less bond. A total of 2162 prizes announced for 47 series of the prize bonds. In each series there 46 prizes. The lottery is commenced on every three months by Bangladesh Bank. Prize Bond is a form of savings scheme offered by Bangladesh Bank, Central banl of Bangladesh, without any interest. As pre predefined rule Prize Bond Draw (Lottery ) held on every three months interval (January 31, April 30, July 30, October 31 of every year). Up to April 30, 2017 a total 87 prize bond lottery was held so far. You can download Result from the Bangladesh Bangladesh Bank website. The result link is also available at the bottom</> of this post.